This blog written by Helen Lowe, Neighbourhood Engagement & Delivery Officer, at Manchester Archives+. I have been researching my father’s family for a number of years, his mother’s maiden name being Hampson. The Hampson family lived for many years in Radcliffe. Towards the end of the 19th century, and into the 20th century, many of them moved to, and lived in Pendlebury and Swinton. 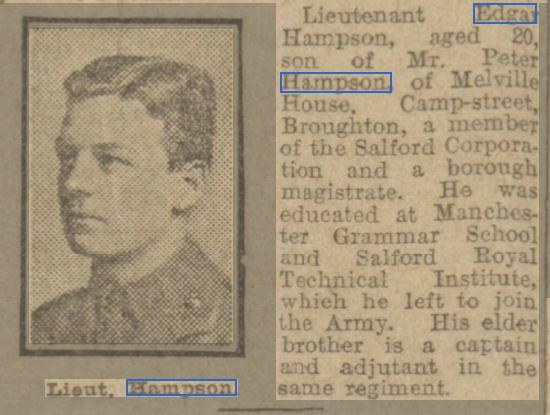 My dad, a retired journalist for a well known local newspaper, knew that there was a newspaper connection somewhere in the Hampson family, but wasn’t sure who, which newspaper it was, or when. I quickly found that the person in question was Peter Hampson (1852-1919). Peter was the 9th of 15 children, and the younger brother of my great great grandfather Richard James Hampson (1842-1922). It turns out that Peter was the founder and 1st proprietor of the newspaper, the “Pendleton Reporter”, later to become the Salford City Reporter, in April 1879. Peter Hampson married Edith Hirst in 1892, and went on the have two sons, Stuart Hirst Hampson (1894-1956), and Edgar Hampson in 1895. Manchester Central Library has an agreement with the British Newspaper Archive (BNA) website, which gives library users full access to the collection when they are in the library. I noticed that the Manchester Evening News (MEN) has recently been added to the website, but only for the war years 1914-1918 and 1939-1945. Making a casual search of this new resource, I looked for Edgar Hampson, and was surprised to find him mentioned a number of times, including a photo of him, and the fact that he had died on the 1st July 1916, the first day of the Battle of the Somme. Up to this point, I hadn’t known the exact details of his death, only the date and whereabouts. 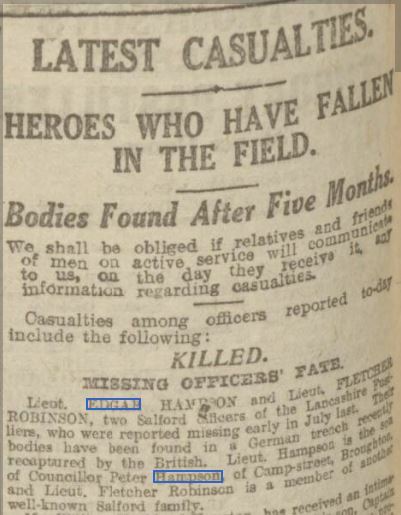 Edgar is first mentioned in the MEN on Tuesday 11 July 1916, under the heading “Battlefield Heroes” which lists “Today’s Local Casualties”, firstly those killed, then the wounded, and then the missing. Edgar is listed under the “Missing” section. Clearly, it wasn’t known if Lieut. Edgar Hampson had been killed, or if he was only missing. This must have been a very difficult time for his parents, not knowing if their son was alive or not, especially as their older son was also serving with the Lancashire Fusiliers as a Captain. Edgar is then mentioned twice, in the MEN on Wednesday 22 November 1916, on pages 2 and 3. This makes very grim reading, but must have been an all too common fate for those killed during this, and other, terrible battles throughout the war. 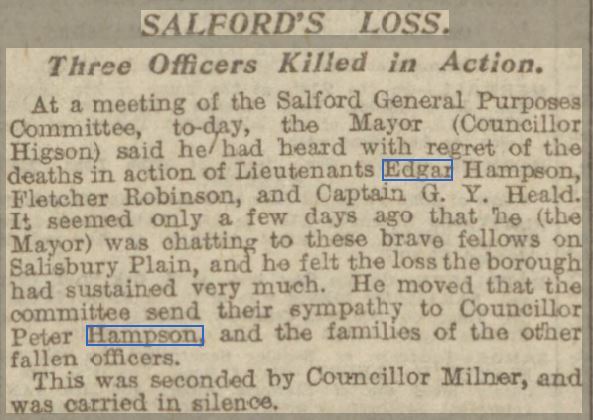 This short piece makes it clear that Edgar’s father, Peter Hampson, was involved in public service as a councillor, amongst other things, as well as being the proprietor of the newspaper he had founded. Is this something that Edgar would have become involved with after the war had ended? Public service and working in his father’s business? Although Edgar Hampson died on 1st July 1916, his family only found out about his death for certain in mid November 1916, making for 4 ½ months of uncertainty. 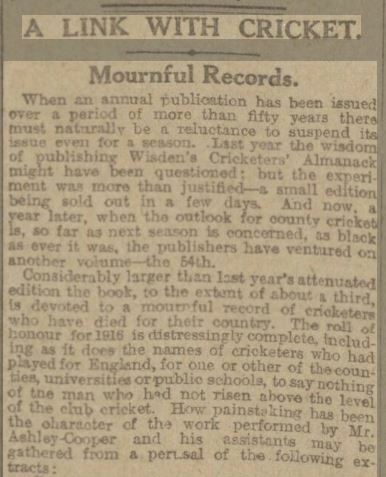 Edgar must have been a skilled cricketer, to have been mentioned in the Wisden’s Cricketers’ Almanac at such a young age. He wouldn’t have been the only Hampson with sporting prowess. His own brother, Stuart, played rugby for the Broughton Rangers Rugby League Club, and was later their Chairman. Also his cousin (my great grandfather) Vernon Radcliffe Hampson (1877 – 1959) was a professional Rugby League player for a few years in the 1st decade of the 20th century, playing for the Swinton Lions. Vernon was in the team that won the 1900 Challenge Cup, captained by Jim Valentine. Vernon is listed in the book “The Lions of Swinton” by Stephen M Wild, in the statistics section, as scoring the most tries (19) in the season 1900-01. I have also mentioned Vernon, because, after he retired from playing rugby, due to injury, he went on to work in his father’s printing works in Pendlebury. Printing, newspapers, and journalism, are well embedded trades in the Hampson family, it seems. Finally, Edgar Hampson is mentioned in the MEN on Thursday 10th January 1918, under the heading “Manchester Officers Honoured”. 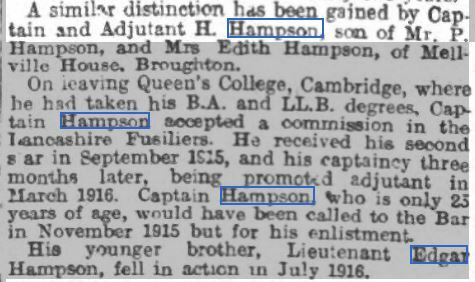 This article is in-fact about Edgar’s older brother, Captain Stuart Hirst Hampson. Edgar is mentioned at the end, as a footnote. Clearly, Edgar’s brother was doing very well for himself. Surely Edgar would have been as similarly successful in his own career, had he survived the war. After grammar school, Edgar attended the Salford Royal Technical Institute. Maybe this is an indication of where his future lay? His grandfather, Robert Hampson (1805-1877), had been a blacksmith, and had worked on the building of some of the railway tunnels, such as the Woodhead Tunnel in the 1840’s, and the Standedge Tunnel, where many of his 15 children were born. Edgar Hampson was part of a very small branch of this huge Hampson family, which, I feel, has a rather sad end, for all the potential shown early on. Edgar’s father, Peter Hampson died in 1919, having passed on the newspaper business to his son Stuart H Hampson. Stuart married Dorothea Winifred Haynes in 1917, a year after his brother died. They had 2 children, Edgar Charles Stuart Hampson (1918-1948), and Margaret Dorothea Edith Hampson (1931-?). As well as running the newspaper with his mother, Stuart was also the chief Air Raid Warden for Salford during WW2; and the National Chairman of the Royal British Legion (RBL). It was while travelling to one of their monthly meetings in London, in January 1956, that he collapsed in a carriage of the overnight sleeper train to London, where he was found the following morning. He died shortly afterwards in hospital. He had been told, but it hadn’t been announced officially, that he was to be awarded an O.B.E. for his services to the RBL. Stuart’s son, also called Edgar, was to have taken over the newspaper business, but he sadly died shortly after the end of WW2, in June 1948, so Stuart sold the newspaper soon afterwards. It is not known if Stuart’s son Edgar, who was married, had any children. I also haven’t been able to find out what happened to Stuart’s daughter Margaret. I decided that my approach to this blog needed to be more personal, and to show Edgar’s place within the wider Hampson family instead. I hope I have succeeded.